When Greg Gardner, an independent developer based in San Francisco, released Launcher for iOS last year, he didn’t think his handy utility would make headlines around tech blogs and push other developers to approach widgets for iOS 8 differently. And yet, after months of not being available on the App Store despite being originally approved in September 2014, Launcher is about to be covered (and used as an example) by the press again. Launcher has been re-approved by Apple, and it’s coming back to the App Store today with the same feature set from six months ago. “They basically said that Launcher was a trailblazer in uncharted territories and that they felt that they needed to make an example of it”, Gardner wrote in a widely shared blog post in December 2014. The post – which would be picked up by large tech publications as well as indie voices – came at an interesting time, as many were wondering what, exactly, had changed in Apple’s App Review process following the launch of iOS 8. But, more importantly, it served as the apparent conclusion to the story of Launcher, an app made by a single developer and based on a concept that cleverly used new technologies in iOS 8 to speed up the act of launching apps. 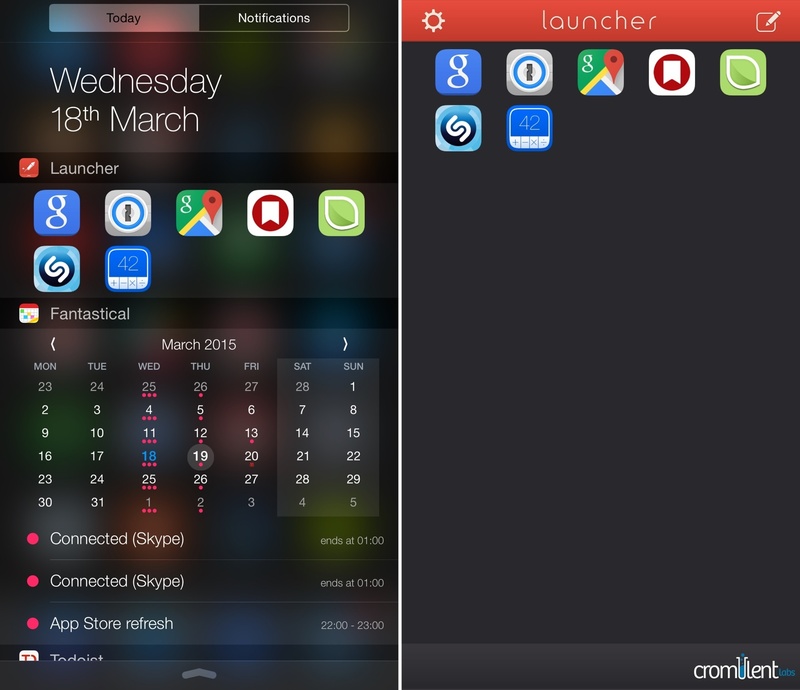 Launcher was an application launcher for Notification Center. In June 2014, Apple announced iOS 8, which, among various features, included widgets – extensions of apps that were going to let users glance at bits of data directly from the Today view of Notification Center. Gardner – who had decided to go full-time with his indie development studio in March – had an idea: what if a widget could offer shortcuts to other apps? He got to work and, by September 2014, his first iOS 8 app, Launcher, was ready for sale. Launcher, reminiscent of other app launchers like Launch Center Pro, abstracted the complexity of more advanced apps to offer something neat and, in hindsight, obvious: buttons to launch apps and actions from Notification Center. Users could set up their own shortcuts in the Launcher app, which could include message and email shortcuts but also third-party apps that had support for URL schemes. Then, once added to Notification Center, Launcher’s widget would show those shortcuts as buttons to take the user to the associated app. Launcher was clever because instead of replicating the feature set of Launch Center Pro or Drafts, it focused on the widget. Its biggest advantage was the ubiquitousness of Notification Center: Launcher shortcuts could be activated from anywhere on iOS, as the Today view can be pulled down in any app at any time. Launcher essentially allowed users to set up a Home screen-like layer with custom shortcuts in the Today view – all based on existing technologies (URL schemes) and new features of iOS 8. Launcher puts shortcuts to your favorite apps in Notification Center. Think of it as an extremely simplified version of Launch Center Pro that supports apps that have URL schemes. I put shortcuts to Shazam, Beats Music, Twitter, and Swarm in a widget, but you can also set up shortcuts for websites and contacts. Alternatively, you can use any URL scheme and launch it as a custom shortcut from the Today view. Launcher may have been built on top of a questionable iOS technology (Apple has never encouraged the use of URL schemes as user-facing shortcuts), but its relative success proved that there was demand for the ability to quickly launch apps from a widget. While Contrast and Agile Tortoise had chosen to wait with widgets for Launch Center Pro and Drafts (two apps that also revolve around the idea of launching other apps), Gardner had done it, and Launcher was a modest hit. Until Apple decided it was no longer okay. On September 23, 2014, Gardner was informed that widgets with the type of functionality seen in Launcher would be no longer allowed on the App Store. 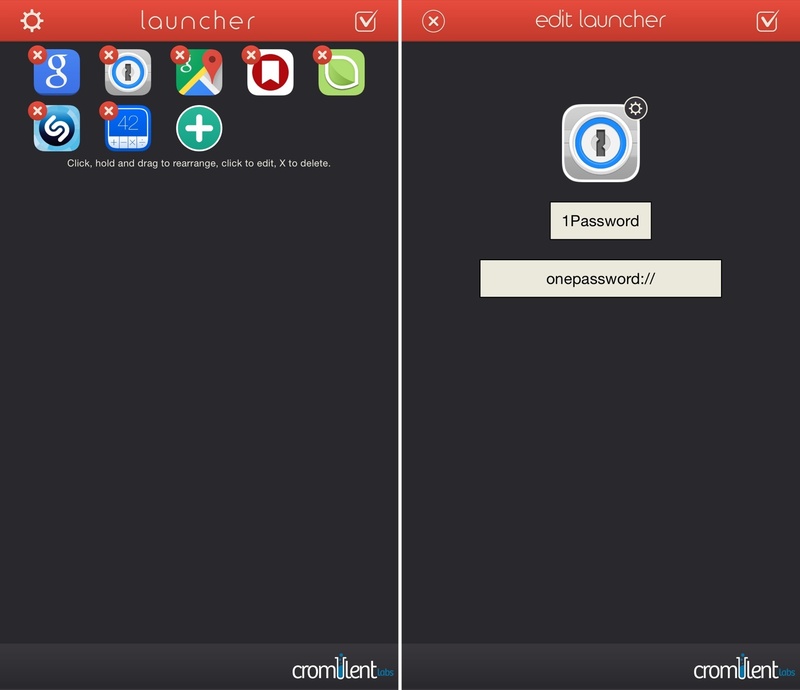 There was no mention of a specific violation of the App Store Review Guidelines – according to a note on Cromulent Labs’ website, Launcher was “misusing” widgets, and Gardner would have a few days to either remove the widget or have his entire app pulled from sale. Three days later, Gardner tried to submit an update with a tweaked widget, but Apple rejected it and removed Launcher from the App Store. “I was hoping to be able to give everyone more of a heads up that the app might be taken down”, Gardner wrote in a message to his customers. The removal of Launcher resulted in more coverage for the app, but, more importantly, it started a conversation on a series of app rejections and re-approvals that confused the iOS developer community for the subsequent months. Most of them, just like Launcher, were apps based on new iOS 8 technologies and that had been previously approved for the September debut of the new OS. In late October, Apple asked James Thomson, developer of popular calculator PCalc, to remove the app’s iOS 8 widget. The following day, the decision was reversed and Thomson was told to keep the widget. Greg Pierce, the indie developer behind Agile Tortoise, had to remove a widget that contained buttons from his note-taking app Drafts; two weeks later, the widget was reinstated. Panic, an established name in the OS X and iOS software scene, went through a similar issue with Transmit, a file manager and transfer app for iPhone and iPad: first, Apple rejected their previously-approved implementation of iCloud Drive, another new iOS 8 feature; then, a few days later, Panic was told that the iCloud Drive integration could stay in the app. The problem with the aforementioned rejections wasn’t the fact that Apple chose to reject some apps or ask developers to tweak their functionality and resubmit them: as the gatekeeper of the App Store, Apple has always been able to do that and shall continue to monitor app releases to ensure an overall quality and safety of the marketplace. Rather, issues, doubts, and criticism arose from Apple’s lack of written guidelines and consistency in applying rules for some iOS 8 apps. Ahead of the OS’ release in September, the company approved certain apps, featured them on the front page of the App Store (and their respective categories), and then decided to reject them because of features that had already been scrutinized. And while in Launcher’s case the developer was told the app could never come back to the App Store, other developers had more luck after receiving press coverage and seeing a rejection reversed over the course of a few days. “You may recall that I wrote a blog post back in December where I begged Apple to publicly release the guidelines they have for widgets”, Gardner told me over email this week. However, there’s an argument to be made about the fact that, with over a million apps on the Store and increasingly complex features available in iOS, perplexing rejections may just be growing pains and stem from simple human error. Apple has no explicit mention of widgets in their App Store Review Guidelines; in the iOS 8 developer documentation, a widget is described as “an app extension that displays a small amount of timely, high-value information or functionality”. It’s possible that Apple wants their guidelines to be vague and leave room for individual interpretation to foster innovation and let developers experiment with new technologies. As iMore’s Rene Ritchie wrote in December, unforeseen implementations of new iOS 8 features that were eventually approved would have never happened “if Apple was far more explicit about its policies up front”. Essentially, while confounding, Apple’s choice not to list every single possible app use case in their guidelines may be better for developers (and users) in the long term. Still, that doesn’t change the fact that, last year, developers like Gardner, Pierce, and Thomson lost valuable development time in trying to understand Apple’s rejections and policies. Gardner’s app ended up being the most problematic one: Launcher stayed off the App Store for six months, and while Gardner tried to spin off some of its functionality with a lighter version called Music Launcher, the second app didn’t take off as much as the original Launcher did. Setting up shortcuts in Launcher. The actual Launcher app is as convenient as it used to be when it was first released in September. Launcher lets you create shortcuts to other apps (both Apple and third-party ones) that will be displayed as a grid in the Today view of Notification Center. Upon first launch, the app will offer a selection of built-in shortcuts based on your contacts, but the best part is the ability to create your own buttons for installed apps and any URL scheme you know. In my case, I created shortcuts to Shazam, Google search and Maps, 1Password, and even a couple of MacStories webpages. This way, I can quickly get to these apps from anywhere without having to go back to the Home screen and tap icons or use Spotlight. Launcher lacks the depth of Contrast’s Launch Center Pro: there’s no assisted action-building process and the app’s system integrations are limited to contacts and installed apps. But, Launcher has a widget, and it’s got some interesting details worth mentioning. In the new Pro version (available with an In-App Purchase), you’ll be able to adjust the size of icons in the grid (useful if you keep several shortcuts) and hide labels. I’ve been able to redownload a pre-release version of Launcher from the App Store earlier this week, and I’ve enjoyed the return of its speed dial for apps in my Notification Center. It’s not as advanced or polished as other iOS app launchers, but it’s right there in the Today view, and I can get to it faster than any other app. It’ll be interesting to see what the return of Launcher will mean for other apps that could implement widgets to launch apps and actions. Launch Center Pro, perhaps the most popular action launcher for iOS, stayed away from trying to add an iOS 8 widget as the developers feared the update could be rejected and, worse, led to outright removal from the App Store. Ari Weinstein, one of the developers behind Workflow, is optimistic about this change, and he told me that they’re working on bringing back a widget that had to be removed from the app’s first version, released in December. It’s unclear if the return of Launcher will result in a clarification from Apple on what’s allowed in iOS 8 widgets and if other developers will be able to add similar functionality to their apps. I have reached out to Apple for a comment, and will update this post as soon as I hear back. What seems likely from Launcher’s history and return to the App Store, though, is that Apple has been thinking about the way developers take advantage of iOS 8, and even without a public update on their guidelines, they are loosening some of the restrictions from last year. Launcher is currently propagating on the App Store (it’s already live in Japan and other countries) and it’ll be available in Europe and the U.S. later today at this link. Launcher is a neat utility, I’m glad that it’s back on the App Store, and I’m excited to see if other apps will be able to implement similar functionalities from now on. As for the future, Gardner doesn’t have any specific updates to announce yet, but he wants to get back to work. “I lost 6 months where I could have been improving the app, so I have a lot of catching up to do”, he concluded.